No, both chlorella and cilantro actually contain iron, so they are not ideal for removing it from the body. Check with your doctor, but in general, the best solution for lowering iron levels is to donate blood. Inositol hexaphosphate (IP6) removes iron (and other minerals) from the body. It should be taken on an empty stomach. Don't know if it will help with hemochromatosis - you'll have to investigate that issue yourself. I used IP6 to control my iron levels and it worked well for me keeping them in the normal range. I also detox which helps to remove iron. "No, both chlorella and cilantro actually contain iron, so they are not ideal for removing it from the body. Check with your doctor, but in general, the best solution for lowering iron levels is to donate blood." How can I make it myself - a tincture of cilantro ? And what else, if I want to make it myself, amounts of tincture and chlorella...? If you want to learn how to make tinctures, there’s actually a very good video on youtube called How to Make Herbal Tinctures. http://www.youtube.com/watch?v=4dloPF1QDuw. As for releasing the exact formula that Jon Barron uses to make Metal Magic, I’m sure you can understand why we would not be able to get that information from Jon. The video of making tinctures yourself is quite dangerous. I am a naturopath and you must understand the active constituents that you are wanting to extract from your plant. Also understanding the full genus and species and the chemotype. Alcohol only extracts certain constituents and you you need properly managed conditions to ensure adequate manufacturing process. Actually, the use of an alcohol/water mix, which is what the video calls for, is the standard for making herbal tinctures. Of course, there are things that can be done by experts in the preparation of the water and alcohol used in the solvent mix that can make it much more effective as a solvent, but not less dangerous. So unless someone is making tinctures out of questionable herbs, there is nothing in the video that is particularly dangerous. I am extremely sensitive and have difficulty detoxing (genetic and lots of history). I know I have candida and heavy metals, especially mercury. I am chronically constipated so my times on chlorella have not been workable. It all depends on what is causing the constipation. If it’s from the sold matter in the chlorella binding you up, then Jon’s Metal Magic tincture would not be a problem, since it’s a pure liquid extract – no solid matter in it. If the problem is caused by an allergic reaction to the chlorella, however, then it wouldn’t matter what form the chlorella was in. I understand the logic behind the treatment and so started to take chlorella, however, as a result I suffered from vomits and diarrhoea. Ias this part of the process of eliminating heavy metals from the system? As is true with virtually any food, some people are allergic to chlorella. You may not tolerate chlorella well. Try starting with smaller amounts and see if you can build up. All of Jon Barron's recommended formulas are in the chart on the page at top called "Products." If you scroll down that page, you will see a list of formulas and companies that make them. Enjoy! Those results listed above are virtually impossible to achieve. I would like to know how you came to the conclusion that you removed so much metal in such a short time. Actually, we didn’t come to that conclusion. Fenestra Research, using their Optimal Wellness Testing methodology, did. Since they ran the tests independently, you can contact them directly to find out exactly how they came to their results. http://fenestraresearch.com/ I will say the results were the best they had seen in the industry. As a heavy metal, cobalt is likely to be removed in any chlelation process at about the same rate as lead. Do u have like a shopping list of everything one would need to complete the full body cleanse that I can just go to instead of having to disect the whole web sight? Please tell me what I need to remove heavy metals from my body. If you go to our Detox Program, you will see the list of products and diet plan you will need for the entire detox. Baseline Nutritionals also sells two detox kits that will get you 90% there if you plan on doing the FULL body detox that includes detoxing the colon, liver, blood, kidneys, gallbladder, etc. and heavy metals from organs. They must go in this order, which is explained in Jon's book (included in kit one). The full study exists as raw data, so it’s not particularly intelligible when seen in that form. It also contains proprietary information, which also precludes it from being published in unedited form. 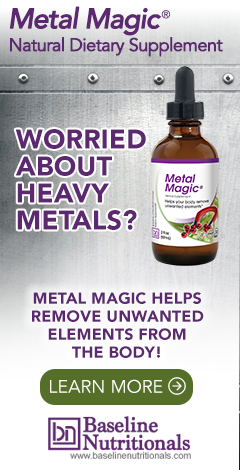 Having a study that proves your Magic Metal chelating kit achieves extra-ordinary results well over virtually any other chelating option in the market and keep it unaccessible to all of us your potential clients makes absolutely no sense!!! Why you have not taken steps to convert all the raw data existing for said study into a easy to understand scientific document to support the extra-ordinary effectiveness of your Heavy Metal Detox Kit? And if you are on the process of creating such document... would you send me a copy? The current formula, which contains humic/fulvic acid is not the same as the one that was originally tested. At this point, the old data is merely suggestive and no longer directly applies. I have read many times that you shouldn't do a metal detox while you still have amalgam fillings in teeth. That cilantro can take mercury into the brain. Is this true?? Considering that 95% of all people who do metal detoxing have not had their fillings removed, if what you say is true, there would be many, many stories of brain damage resulting from metal detoxing – but there aren’t. Let’s think this through for a moment. When you do a metal detox, the metal isn’t coming from your fillings, it’s coming from the soft tissue in your body. In other words, the detoxing is pulling out the mercury that is already in your body, not adding mercury to it. If anything, it is lowering levels of mercury in your body and brain, again, not adding to it. Make sense? Also, Jon recommends using a combination of cilantro and chlorella to even further minimize any risk. The cilantro breaks the electrical bond that the metals have with your soft tissue; and the chlorella then “sponges” up the chlorella that has been released. The bottom line is that pulling out amalgam fillings before a metal detox is not necessary. Simply repeat the detox slightly more often because you have a guaranteed source of mercury still in your mouth that is continually depositing new mercury in your soft tissue.